There are many approaches to making sense of our human drive for togetherness. This course distills the science of relationship to its essence and then explores the implications for working with children. The course is divided into eight sessions, each containing an hour of videocourse material. Because of the density of the material, the DVDs are not offered as stand-alones but only in the context of the continuing education course or supported by trained facilitators. The science of relationship currently exists in fragmented bits and pieces all over the empirical map: biology, sociology, embryology, ethology, epigenetics, neuroscience, psychology, medicine, psychology, and so on. The irony is that we have never known more about the relational context required for parenting, teaching and treatment, and yet this knowledge is failing to inform our everyday practice and policy. According to Gordon Neufeld, this failure of implementation may stem from the current lack of theoretical coherence as well as the esoteric language typical to these fields of inquiry. Neufeld's unique contribution is to put the puzzle pieces together to create a coherent model of attachment, using language that is accessible to all. His model of attachment has profound implications for practice, whatever one's involvement with adults or children. The course is structured into eight sessions with one hour of instructional video per session. Attachment impacts everyone yet is rarely put into words. 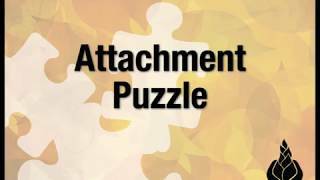 In this session the various pieces of the attachment puzzle are identified, attachment defined, and the hierarchical nature of attachment discussed. The ‘alpha complex’ is also introduced. Ignorant of attachment, we have made false assumptions regarding children’s receptivity to care and direction. Once understood it becomes obvious that children were meant to be dealt with in the context of their attachment to the adults responsible for them. The implications are discussed as well as the constructs of peer orientation and counterwill. The human capacity for relationship is a potential that only fully develops when conditions are conducive. The first six years of life are where this basic human capacity begins to unfold. A flight from vulnerability will cripple a child’s ability to attach and hold on when apart. The model of attachment that is presented can be applied to any age and any relationship. Also discussed is how to engage the attachment instincts and build relationship. Maturation is the outcome of fulfilling attachment. The greatest developmental sin is to prematurely push for results, such as independence and social integration, instead of nurturing the underlying attachment roots. Children must find rest from the work of attachment for healthy development to occur. One cannot make sense of a child without an understanding of the polarized nature of attachment. When not informed by attachment, shyness is either pathologized as social anxiety or misconstrued as lack of confidence or self-esteem. Shyness serves an important function in preserving existing attachments and should be honoured rather than countered. The implications of shyness are discussed for dealing with children outside their primary working attachments. Nothing impacts mammals more than facing separation. Humans are doubly impacted because separation is much more than physical and the anticipation of separation can have the same effect as the actual experience. The ‘separation complex’ is introduced as the core of alarm problems, alpha problems, aggression problems, the bully instinct and much more. When the vulnerability is too much to bear, the brain’s ultimate defense is to reverse the attachment instincts. This reaction can be situational and temporary or chronic and pervasive. Understanding this attachment reversal is essential to dealing with wounded children as it is often at the core of various and diverse symptoms and syndromes. Also discussed is how to deal with this challenging dynamic. The closest we could come to a panacea for children’s problems would be to reduce the separation they are facing. This session explores the ways we as adults can do this for the children in our care. The tuition fee for taking the Attachment Puzzle through continuing education is $200. The tuition includes a virtual campus student pass of four months to access the videocourse material as well as other supporting materials. If a personal copy of the DVD set is desired, the tuition fee is $275. Course Coordinator Darlene Denis-Friske has been a member of the Neufeld Institute Faculty since 2010. She comes to this role with a strong academic background as well as a professional involvement in treatment.